This regional performing and visual arts center in Southern Wisconsin needed an accessible and graceful outdoor connection between their historic church and new $3 million addition. Two linked courtyards with limestone seat walls resolve the complicated geometry and elevation changes between building entrances. The Proscenium Courtyards are proportioned to provide a socializing space for the frequent weddings held at the facility, for outdoor youth theater practice that utilizes the staircase, and to enable the exhibition of outdoor sculpture. 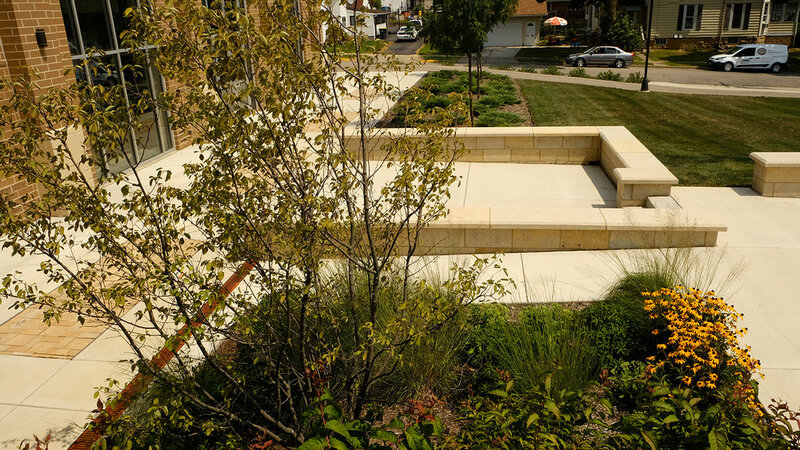 Working with the Center’s building committee, I produced construction drawings for the courtyards and planting plans for the landscape around the buildings including the north Sculpture Garden. I invited Avant Gardening & Landscaping, McFarland, Wisconsin to team with me on installation. Tim Haislip, He-Rock Masonry LLC, New Glarus, Wisconsin (who has done innovative masonry work at New Glarus Brewing, home of Spotted Cow beer) constructed the handsome limestone seat walls. Sculpture Garden plantings one-year after installation, filling in nicely. Two raised berms for the display of artwork. Extreme conditions between buildings from bright sunlight to shadow, dry to wet meant plants ranging from prairie types to forest and wetland species, and no-mow grass mix. 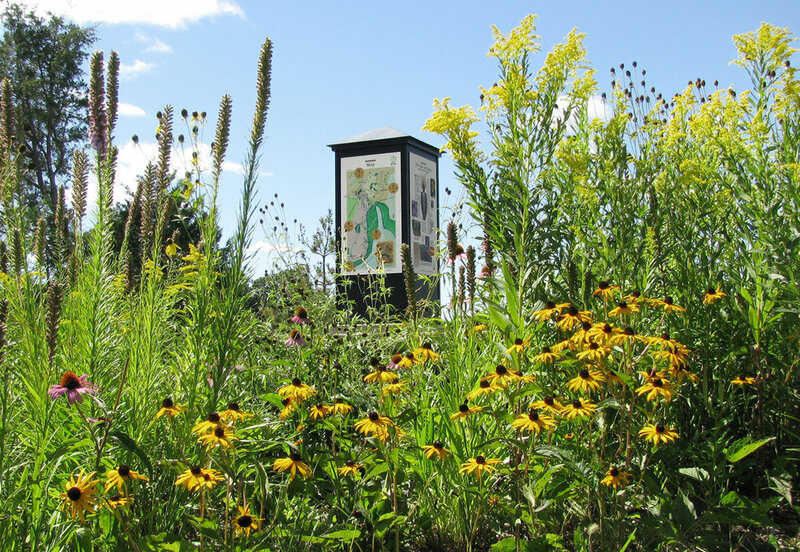 Three acres of wetlands, oak forest, restored prairie and even a nearby capped landfill inspired the Discovery Garden at Alpine Park. The client saw potential for this children’s playground to use public art to interpret this complex setting. The Garden features a Play Area and a 1/4 mile path system that is the format for a game by graphic designer Keith Christensen about the native landscape and the impact of recycling. Nearby Ramsey Elementary School has a robust environmental education curriculum and inspired the game’s themes and imagery. Play structures use recycled and sustainable materials including carved and fitted boulders by sculptor Peter Morales that provide accessible seating. Children experience wood, stone, and native plants; real materials from nature. I led the project through all phases of playground design: Conceptual Master Plan; design development and cost estimation; construction documents and specifications for bids; and construction observation. I developed the ecological information for the game; interpretive text and illustrations for the display kiosk; and selected the artists and supervised their contributions. Discovery Garden at Alpine Park is featured in You Are Here, Exploring Art in the Suburbs published by the McKnight Foundation and FORECAST Public Artworks, 2005.